It was a tough competition today. Congratulations to all! Congratulations guys. I am so proud of you all. Giussepe Falbo also won the best technique award! ​Congratulations to all! I am proud of you! We had an awesome time at the IL State Championship. We had 14 competitors and 13 brought at least one medal home! Also, Sharrod Graham fought but got hurt and was unable to continue. Great job everyone and let's train hard for NAGA and or US Grappling. Please check out some of Alec Campos Highlights fights and if you haven't done it yet, like our FB page! Next tournament will be NAGA on May 3rd for kids and adults. I recommend all our beginners to try NAGA since it will have a novice division. ​It was a weekend full of action! During Saturday and Sunday, we had our athletes fighting exciting matches! Also competed Fernando Lopez who didn't place at this time. We congratulate them for their efforts and let's train hard for the next one on May 18th! It was a great day today at the Veterans day Judo tournament. We had 9 athletes representing PowerSource. Third place winners: Kira Ruiz and Mikal Mandichak. Anthony Richmond won his second consecutive MMA Fight on 11/10/12 at the Libertyville Sports complex. He won on the 3rd round by triangle choke. 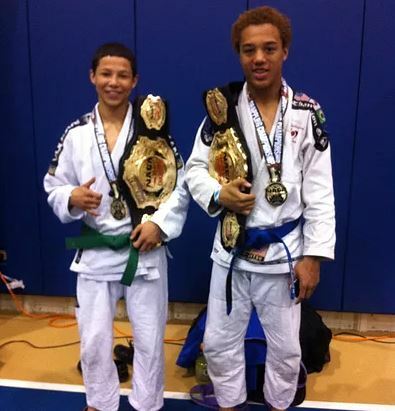 Congratulations to our 3 athletes representing PowerSource and Carlson Gracie Team. Congratulations to our 5 athletes representing our school and Carlson Gracie Team. I am proud of you guys!